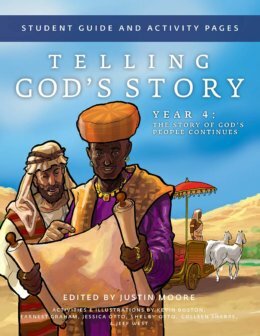 Coloring pages, group games, and activities to accompany and reinforce the lessons in the Telling God’s Story, Year Four Instructor Text. This product is available only as a digital download, exclusively from Olive Branch Books. This downloadable supplement is filled with coloring pages, simple but engaging crafts, service projects, activities, and group games, all based on the stories of the New Testament. These lesson plans, designed to accompany the weekly lessons laid out in Telling God’s Story, Year Four, are perfect for home or classroom use. Coloring pages accompany each lesson and accurately reflect the historical setting of the original stories, while a full range of crafts, games, and activities help young students understand and remember.